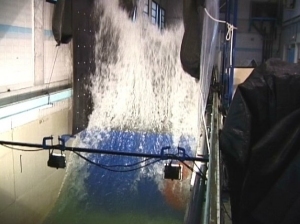 Largest flume with wedge paddle type (deep and intermediate wave condition), 4 m water depth and waves up to Hmax=1.5 m.
Windows and an optical test section along the flume (based on the clear water provided by its filtering/pumping system) for non-intrusive optical observations. 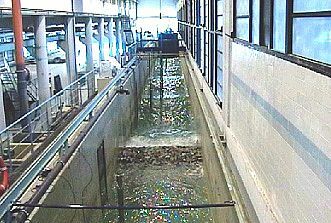 Recirculating flow allowing the study of wave-current interaction. 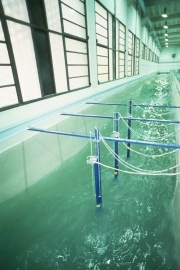 Wedge-type wave paddle, particularly suited for internmediate depth waves. Generation of regular and irregular waves (parametric or user-defined spectra, as well as actually measured time series). 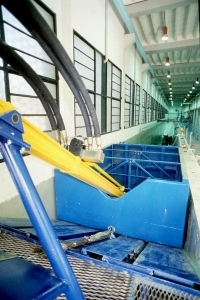 System hydraulically actuated and PC-controlled. Wave heights up to 0.9 m with SWL of 2.65 m.
Structure functional-hydrodynamic analyses (run-up, run-down, overtopping, reflection and transmission). 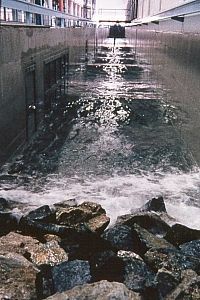 Wave beach structure interactions (scouring, fluxes through and above the structure, modified profile morphodynamics).